A friend recently shared his catch of mahi with us that he caught offshore I was excited to cook (and eat) the wild caught fresh fish. I knew that I wanted to blacken it because this is my favorite way to eat fish right behind sushi! I typically make a cucumber salad or cabbage slaw as a side to this spicy seafood dish but today I wanted to try something new. I wasn’t quite sure what I wanted to create in the kitchen to pair with this spicy dish but I knew that I wanted to use quinoa. 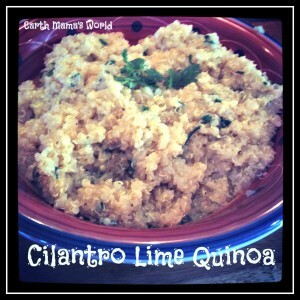 I turned to the internet and discovered a delicious recipe from sarcastic cooking for a cilantro lime quinoa. This sounded like a fabulous pair for blackened mahi mahi, or chicken, as the original recipe pairs it with. Luckily, I had all of the necessary ingredients in the kitchen. I proceeded to make blackened mahi mahi topped with a creamy avocado sauce served over cilantro lime quinoa. My husband and I loved this meal and it will certainly be made often! Cooking the fish is simple and takes only 5 minutes. I make my own blackened seasoning and you can see the recipe here. 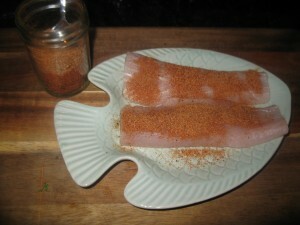 Sprinkle blackened seasoning on both sides of your fish. Adjust the amount of seasoning to how spicy you would like your fish. Heat about 2 tablespoons of oil, I use coconut oil, in a skillet over medium high heat. Once the oil is heated through place your fish fillets on the skillet for about 2 1/2 minutes per side. My filets were about 3/4 inch thick so if yours are thicker please adjust the cook time. I want to mention that my kids do NOT like spicy foods. They are young and I hope that they acquire a taste for spicier dishes soon. So this being said to please all of the members of our family I simply leave the blackened seasoning off of the kids fish and add a more mild spice such as garlic and some herbs then bake in the oven while I am cooking the rest of the meal. Now let’s get to the cilantro lime quinoa! I cook the quinoa prior to cooking the fish. 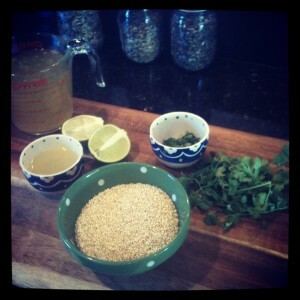 I mix the quinoa with the remaining ingredients once the fish is finished cooking. 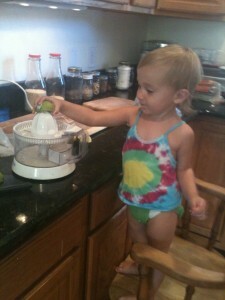 You also need a cute little girl to help you juice the limes! What you do:Add the vegetable or chicken stock and quinoa to a medium sauce pan. Bring to a simmer over medium/low heat. Reduce the heat to low and simmer for ten to fifteen minutes with the lid on, until all the stock has been absorbed. Set aside. Add the warm quinoa to a large bowl. Toss in the lime juice, cilantro, sea salt and pepper. Stir up until combined. 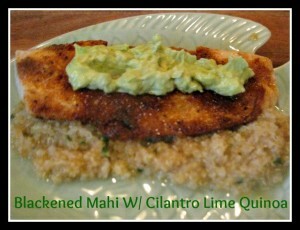 If you want to ‘cool’ the blackened mahi mahi down a tad you can top it with a quick and yummy avocado cream sauce. All you need is an avocado and greek yogurt. 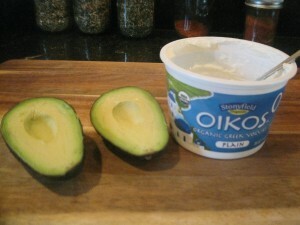 Simply puree the flesh from the avocado with 2 tablespoons of plain greek yogurt until smooth. My husband loves this sauce…he hates yogurt so please don’t tell him this recipe! This is a wonderful meal that my family enjoys often! To see more of my recipes please click here. That’s a great idea making a less spicy version for the kids–my husband and I would love this blackened, but I have always been afraid how the kids (even as teens) would react. Looks delicious! to say I truley enjoy looking through your blog website. 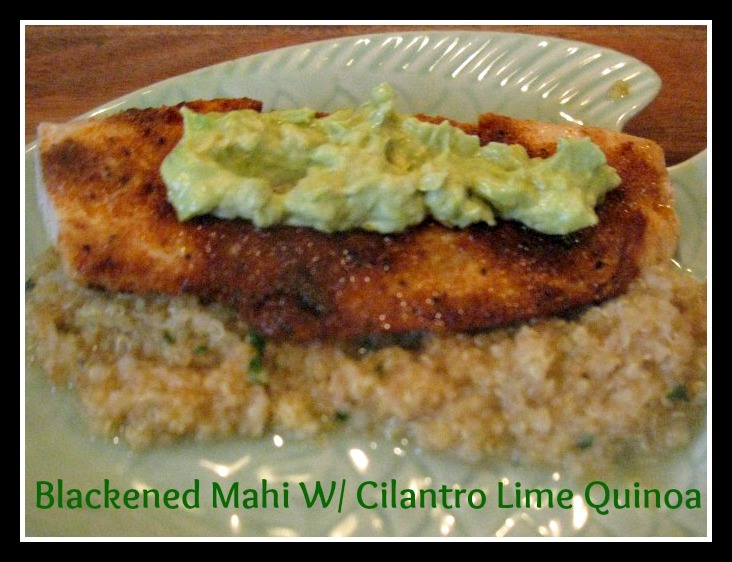 I’ve decided to bookmark it at reddit.com with the title: Blackened Mahi With Cilantro Lime Quinoa | and your Website address: https://earthmamasworld.com/blackened-mahi-with-cilantro-lime-quinoa/. 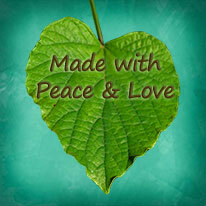 I hope this is all right with you, I’m trying to give your good blog a bit more exposure.